Springtime is in the air and the weather is starting to feel warm and pleasant again. Chances are you’ve been neglecting your home or business cleaning and maintenance all Winter due to the conditions and other responsibilities. I can’t blame you, I’ve been doing the same myself! But Spring cleaning doesn’t have to be a burden. It can be a way to revitalize and renew your property. A way to bring some light and warmth back into your life as the season changes and we head to warmer weather. One of the best reasons to spruce up your home is to prepare for barbecues and other fun party related events. We all know how important it is to impress your guests with the cleanliness of your home. Whether it’s getting your interior/exterior windows cleaned to show off your impressive Pacific Northwest view or pressure washing your paths to clean off the grime and dirt that has accumulated, getting your home prepped for friends and family is a must. Our pole fed window washing machine allows us to clean most homes from the ground level in a safe, efficient, and effective manner. Cleaning your own windows can be a major frustration for homeowners. You need ladders, cleaning solution, and the appropriate tools to get the job done correctly. Not to mention, if you are like me, your schedule is probably already pretty full. Finding the time or energy to do some dirty, difficult tasks can be the main reason why Spring cleaning gets delayed. Don’t fret, we’d be happy to help you with that and renew your house to it’s very best quality. Pressure washing can be even more problematic. Not too many homeowners have the equipment to get the job done. We have two different kinds of high quality pressure washing equipment to make sure that your property looks pristine for guests, family members, and your neighbors too. We have the traditional ‘power gun’ that blasts away the surface layers of grime from your walkways or deck. We also use a ground level pressure washing machine that spins and scrubs away all the grime too. Between these two different tools we have all the equipment we need to get your property back to its very best. Give us a call to obtain a free fixed cost quote for pressure washing, window washing, and more. We’d love the opportunity to help make your property look brand new. 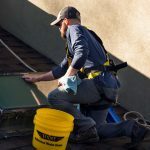 If you have a need for gutter cleaning, moss removal/roof cleaning, and solar panel cleaning too. Contact us at 206-602-3813 or info@renovaexteriors.com to get a free quote.